Aargh. 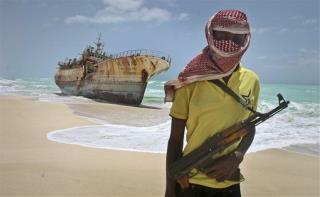 The End of Somalia's Pirate Days? (Newser) – It's been anything but smooth sailing for Somali pirates lately, as the heady days of hijacking and plunder dry up at the hands of international military efforts and simple on-board security enhancements, reports the AP. The flow of whiskey has ebbed and the hookers have gone home in villages once known as pirate havens, which now look more like refugee camps. "There's nothing to do here these days," says one. "The hopes for a revitalized market are not high." Nothing left to do but come to America. having guns on board and shooting back worked. now what liberal would have thought of that? They are all just really bad eggs.